In this very special episode, we begin a two part celebration of the 10 year anniversary for Brain Science. The podcast began in December 2006, which makes it one of the longest running shows since the first podcasts were launched in 2004. Ten years is a lot of ground to cover, so for this episode we are only focusing on the early years from 2006 to 2011. Learn why the podcast began and get a peek into the format changes the show has had over the years. This episode contains something that you rarely see in the show - listener feedback! You'll get to hear what listeners think about the show, how they use the show to help them with their work, and you'll even get to hear from a critic! So many of you have reached out over the years, and although there isn't room for all our feedback in this episode, please know that each and every email that has been received is appreciated! In this show, we mentioned the best ways to listen to episodes from our first 5 years. Our episode archive is available to Premium subscribers for only $5/month. The best way to access these episodes is via the FREE Brain Science mobile app, which is available for iOS, Android, and Windows phone. You can also support the show via Patreon. New episodes of Brain Science are ALWAYS FREE. All episodes posted after January 1, 2013, are free. See the individual show notes for links to the audio files. This is a brief 10 minute audio that provides information about Brain Science (formerly the Brain Science Podcast). It includes a brief introduction to the show, some tips about the website and how to support Dr. Campbell's work. I launched the Brain Science Podcast in December 2006, so to celebrate I am posting my Fifth Annual Review Episode (BSP 80). This podcast includes a review of the highlights from this year's episodes along with my reflections on what we have learned about brain health over the last few years. I also take a look ahead to 2012 when I hope to continue to produce a Brain Science Podcast every month. BSP 72: Stephen L. Macknik and Susana Martinez-Conde, authors of Sleights of Mind: What the Neuroscience of Magic Reveals about Our Everyday Deceptions. Extra: Books and Ideas with Dr. Paul Offit, author of Deadly Choices: How The Anti-Vaccine Movement Threatens Us All. BSP 74: Olaf Sporns, author of Networks of the Brain. BSP 75: David Eagleman, author of Incognito: The Secret Lives of the Brain. BSP 76: Sian Beilock, author of Choke: What the Secrets of the Brain Reveal About Getting It Right When You Have To. Extra: Books and Ideas with Carol Tavris, co-author of Mistakes were Made (But Not By Me). BSP 78: Review of Beyond Boundaries: The New Neuroscience of Connecting Brains with Machines---and How It Will Change Our Lives by Miguel Nicolelis. We also have a BSP Fan Page on Facebook and a Discussion Forum at Goodreads.com. Please check out the new Brain Science Podcast T-shirts. Read episode transcripts on your iPhone, Ipad, or Android device with the BSP app. Your iTunes reviews are greatly appreciated. See the episode transcript for additional links and more information about 2012. 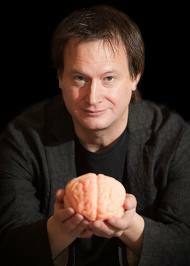 Send your feedback to Dr. Campbell at brainsciencepodcast@gmail.com. Episode 64 of the Brain Science Podcast is our Third Annual Review Episode. It includes a review of some of the major ideas we talked about in 2009 and a look ahead to what I have planned for 2010. Teenagers: A Natural History, by David Bainbridge (BSP 63). Play: How It Shapes the Brain, Opens the Imagination, and Invigorates the Soul, by Stuart Brown, MD (BSP 60). Making up the Mind: How the Brain Creates Our Mental World, by Chris Frith (BSP 57). Did My Neurons Make Me Do It? : Philosophical and Neurobiological Perspectives on Moral Responsibility and Free Will, by Nancey Murphy and Warren S. Brown (BSP 53 and BSP 62). Out of Our Heads: Why You Are Not Your Brain, and Other Lessons from the Biology of Consciousness, by Alva Noë (BSP 58). David Bainbridge, PhD: University Clinical Veterinary Anatomist from Cambridge University (BSP 63). Stuart Brown, MD: retired psychiatrist and founder of the National Institute for Play (BSP 60). Warren S. Brown, PhD: experimental psychologist from Fuller Theological Seminary (BSP 62). Guy Caldwell, PhD: molecular biologist from the University of Alabama (BSP 59). Patricia Churchland, PhD: neurophilosopher from University of California at San Diego (BSP 55). Chris Frith, PhD: neuropsychologist from University College London (BSP 57). Allan Jones, PhD: Chief Science Officer at the Allen Institute for Brain Research (BSP 61). Eve Marder, PhD: neuroscientist from Brandeis University (BSP 56). Michael Merzenich, PhD pioneer in neuroplasticity (BSP 54). Brain Science Podcast Facebook Fan Page. Brain Science Podcast iPhone application. Brain Science Podcast Discussion Forum. Brain Science Podcast Flickr Group. Your donations help keep the Brain Science Podcast going.